Goldwater's Sedona Red Hot Salsa is a rich and complex mix of natural ingredients including tomatoes, green chiles, jalapenos, carrots and more. 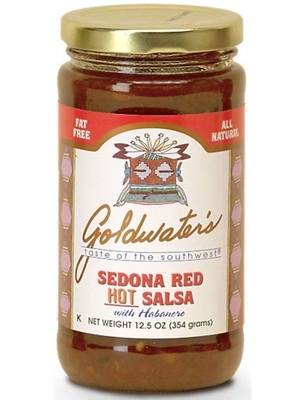 Goldwater's Sedona Red Salsa is elegant and distinguished, with a fresh flavor. Our extra spicy salsa gets its heat from the Habanero pepper (the world’s hottest chile). 12oz. Great flavor! Good heat... it creeps up on you. I didn't think I'd like the carrot strings but they add a great sweet note to the flavor. I'd definitely order this salsa again!